There’s some debate around the busiest day of the year at restaurants, but there’s no doubt that Valentine’s Day in Vancouver falls in the top five. While there are more than 5,000 restaurants in the greater Vancouver area, you’ll need to put in a little effort to find one worthy of your honey – and that still has reservations available. With less than one month until the big day, here are 19 Valentine’s Day restaurants that are perfect for celebrating love. Elegant and refined. This Downtown Vancouver restaurant is offering lovebirds a special 4-course dinner for Valentine’s Day only. Cibo Trattoria’s simple, rustic candlelit ambiance and authentic Italian-inspired food prepared by Executive Chef Curtis Luk, makes a great choice for couples. Enjoy items like Taglioni Con Scampi, Agnello Scottadito and Torta Di Crespelle as part of the set dinner menu or as à-la-carte. Scoot over next door to UVA Wine & Cocktail Bar to finish off the evening with Bar Manager Wyeth Malers’ special Valentine’s Day creation: The Cupid’s Embrace, which is made from rye, cassis, crème de violette, Lillet and Prosecco and is finished with watermelon radish petals in a vibrant lover’s libation. Above the busy streets of Robson, critically acclaimed wood fired Italian gastronomic CinCin Ristorante + Bar is offering a special four course menu on February 14th. Prepared with the freshest and finest ingredients you can source, masterful creations by Chef Andrew Richardson and CinCin’s award-winning wine program that is hand picked by Shane Taylor may have exactly what you want to impress your lover. Price: $85 per person. Recommended wine pairings available for extra. Reservation: 604.688.7338 or emailing info@cincin.net. This cozy Fraserhood eatery is offering an exclusive Valentine’s Day menu for only 14 couples who are looking for an intimate ambiance and decadent menu. Crowbar’s Feb.14th menu will feature a 32 oz. organic dry-aged ribeye steak that is aged in roast beef fat and sprinkeled with parmigiano rind. Yum! The steak is rounded up with Chef Justin Ell’s allstar pasta, sides, and dessert. Level up your Valentine’s Day with Cocktail Master and Sommelier William Johnson’s special love potion: The Mia Wallace, which is inspired by Pulp Fiction and is made from Resurrection Rose Gin, Campari, Becherovka, blood orange liqueur, fresh lemon juice, and sparkling wine. With big names like Paul Grunberg, Craig Stanghetta and Mark Perrier behind this new Italian cafe joint, you know it is darn good. Located in Commercial Drive (or so-called “Little Italy”), Caffè La Tana holds an intimate 20-seat dining area and a grocer section that sells local and imported cheeses, meats and more. 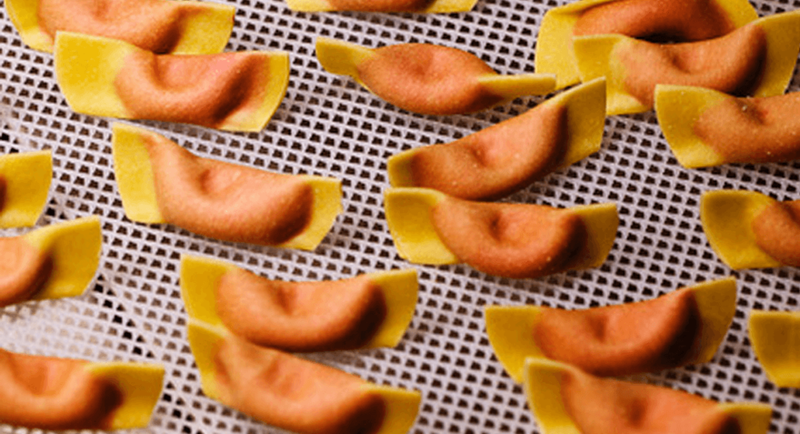 This Valentine’s Day, bring your love one down to the Drive for La Tana’s special house made beet and ricotta stuffed ravioli or take it to go. Freshly cut roses also available for sale. This year, Vancouver’s Best Seafood and Best Upscale restaurant is offering a special multi-course menu for Valentine’s Day. From poached sunseeker oysters to prime beef striploin to doses of Caviar or truffles, Executive Chef Roger Ma, Pastry Chef Kenta Takahashi, and the Boulevard Kitchen & Oyster Team will be sure to make all lovebirds are beyond satisfied. Price: $120 per person. Optional wine pairings available. Look no further seafood lovers. Award-winning and legendary San Francisco styled seafood grill spot, Joe Fortes Seafood and Chop House has what couples are looking for this Valentine’s Day. The downtown Vancouver restaurant is offering a special Lover’s Platter from Feb 14th - 17th. 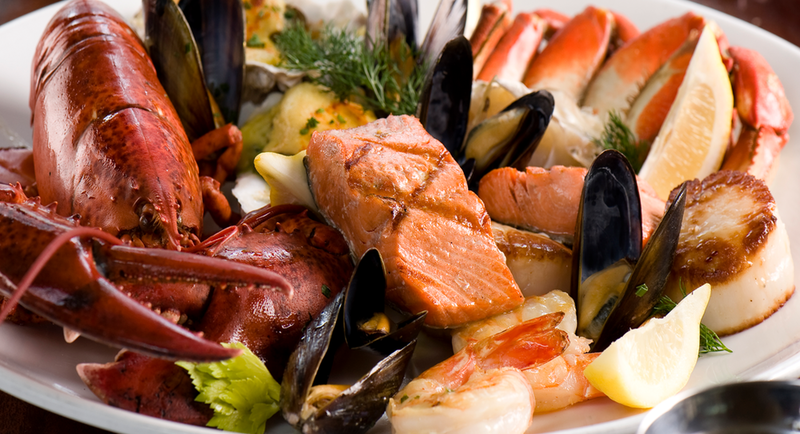 The shared platter contains 1.5lb lobster, snow crab, jumbo scallops & prawns, wild sockeye salmon, oyster rockefeller, steamed mussels, pico de gallo, and drawn butter. Make it a meal to be remembered by adding a New York (12oz) for $46.95 or Add Two Sirloin Steaks (7oz) for $41.95. Outstanding farm-to-table Vancouver restaurant, Fable Kitchen is presenting an affordable Valentine’s Day dinner on the 14th. Fable Kitchen was established by Seasons 2 Top Chef Canada participant, Trevor Bird. The restaurant is committed to using locally sourced ingredients to craft their impeccable dishes. Not only does this mean their dishes are tastier, more nutritious, but also supports B.C. farmers and producers. The special Valentine’s Day four-course menu will feature items like Tempura Oysters, Mushroom Barley Risotto, Elk, and a Chocolate Tart. Price: $50 per person. Optional wine pairing available. Vancouverite David Hawksworth welcomes you to celebrate Valentine’s Day at his downtown Vancouver exquisite contemporary Canadian restaurant. The special ticketed dinner features a multi-course meal with items like deep bay kusshi oysters, steelhead salmon & tuna terrine, braised neck of lamb, and lobster parfait. Wow your date with Hawkworth’s lavish interior decor, impeccable service, and high quality food. Men - Thinking about getting flowers again this year? Juke Fried Chicken is helping you switch it up this year. On Valentine’s Day, they’ll be offering their Lets Cluck fried chicken bouquet, which is ingeniously replaces roses for what everyone actually wants instead - 8 pieces of Juke’s mouthwatering crispy fried chicken. The bouquet will be available for pick up from 11 A.M. to 9 P.M. on Feb. 14th at both their downtown Vancouver locations. Bring your lover to a place for royalty (Queen B counts as royalty right?). Vancouver’s top Japanese restaurant is wooing all love birds with their 5-course Valentine’s Day Kaiseki, which features their renown flame-seared Aburi sushi, seafood items expertly curated by their chefs, Ora King Salmon, and an exclusive Salted Dark Chocolate Raspberry Fondant. Price: $98 per person. Optional premium sake pairings available. Located in the heart of downtown Vancouver’s Yaletown neighbourhood, Miku’s sister restaurant Minami will also be welcoming couples for a special romantic exclusive Valentine’s Day dinner menu. Indulge in their delicately cut Maguro Sashimi Trio, Surf and Turf entrée and beautifully presented Manjari Chocolate Cherry Tart. Fairmont Hotel Vancouver’s Notch8 will be offering a special 5-course Valentine’s Day dinner and transform their Private Dining Room into a decadent Chocolate Cave Buffet, which will surely make it a memorable outing. From the ceiling-to-the-floor, it will be covered with chocolate - giving a stunning visual. Inside the room you’ll also be welcomed with a glass of bubbly and 20 different chocolate desserts. The Chocolate Cave Buffet will be available from Feb. 14th - 17th. Richmond’s luxury French inspired food and wine restaurant, Origo Club, will be presenting several exclusive Valentine’s Day dishes for couples to enjoy. Head Chef David Pan has created a tenderloin pepper steak with parsnip and fennel ($55) and a special dessert course that features white peach, meringue, and blood orange sorbet ($16). Before leaving, be gifted Pastry Chef Remi Ho’s hand made box of milk chocolate passionfruit truffles. 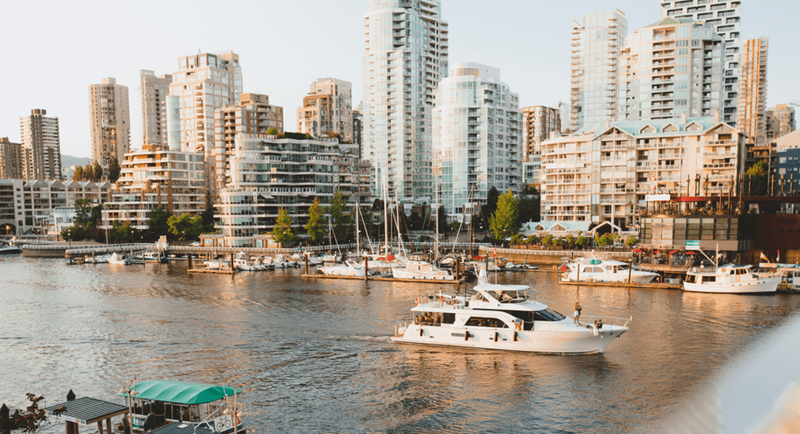 With the gorgeous waterfront view, this Granville Island eatery will surely impress your loved one and make it a romantic dinner they’ll surely remember. The popular Sandbar will be offering a special Valentine’s Day menu that highlights their masterful fresh seafood dishes. Indulge in their oyster platter, Lobster Thermidor, Steak Oscar, Chocolate Lava Cake, and more. Get in the mood as live music will be played during the evening! Looking over the breathtaking majestic West Coast snowcapped mountains and downtown skyline, Seasons In The Park (Queen Elizabeth) will wow you and your date this Valentine’s Day. The special 3-course dinner menu by 25 year culinary veteran Chef Joseph Thomas will make sure your evening is beyond expectations. Fun fact: Chef Joseph Thomas cooked for the Royal Family during their visit in 1994. With the opportunity for a nice romantic walk along the seawall nearby, the aesthetic Teahouse in Stanley Park is situated at a prime spot for Valentine’s Day. The popular restaurant is presenting a special seafood centric 3-course dinner menu from Feb. 14th - Feb. 16th. We’d be disappointed if you miss out on the romantic seawall opportunity. Once night falls, the street lights flicker on and make Gastown look something that can only be described as magical. With the enchanted view and glowing Steam Clock just steps away, Water Street Cafe makes a darn good romantic spot. From Feb. 14th - Feb. 16th, Chef Alan and the Water Street Cafe team is offering a special 4-course menu. If you’re looking for a short romantic getaway this Valentine’s Day, Sea to Sky Gondola may have what you’re looking for. With the majestic views of the snow capped mountains all around and countless opportunities to enjoy romantic walks amongst towering trees at the Spirit Trail, it’s easy to make this trip something truly memorable. With only their 5PM seating available, Chef James and the Summit Lodge team has a special Valentine’s Day set menu for you and your loved one. After quickly being named the finalist for Best New Restaurant by Vancouver Magazine, Yuwa Japanese Cuisine is becoming a spot that many people are looking at. This makes sense when they have high caliber talent like Executive Chef Masahiro Omori and renowned Sake Sommelier and Co-Owner Iori Katoka. 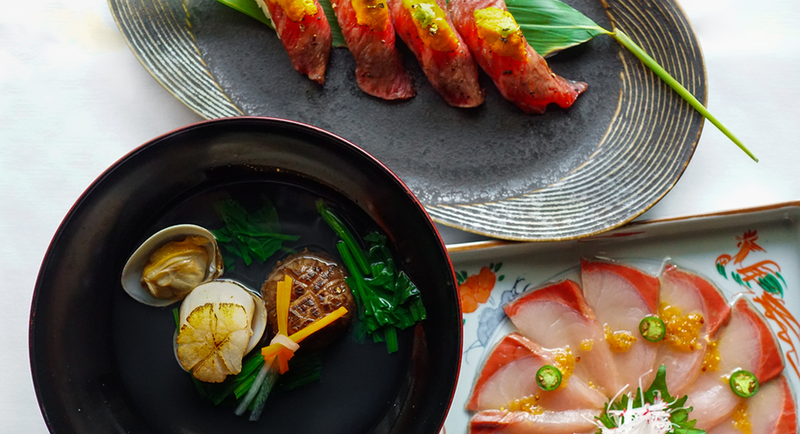 Using the best local and seasonal ingredients in their traditional Japanese kaiseki and having the best selection of artisan sake and wine, Yuwa is the perfect spot for couples looking to try something different this Valentine’s Day. They’ll be offering a special omakase course and a-la-carte menu for couples to enjoy. Price: Omakase is $120 per person and requires one week advance reservations. Downtown Gastown upscale French-inspired West Coast restaurant L’Abattoir created a special dessert for couples this Valentine’s Day. Located in a refurbished 19th Century heritage building, the popular dinner spot is offering lovebirds to finish off their dinner with a decadent Valentine’s Day S’more, which is made from dark chocolate ganache, tasted marshmallow, ice cream, graham and milk chocolate crumb. Their sister restaurant Coquille down the street is also offering a special steak and lobster dish and dessert. 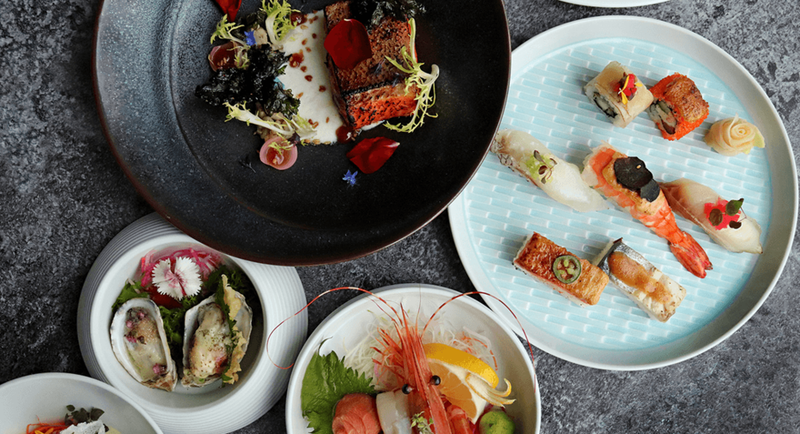 Located inside Downtown Vancouver’s Four Seasons Hotel, the modern and award winning YEW Seafood + Bar has crafted a stunning special five-course dinner menu for Valentine’s Day. 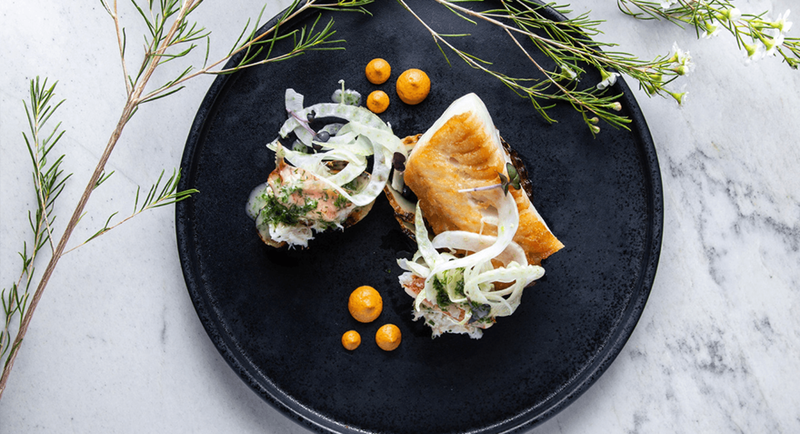 Couples will be wide-eyed with enthusiasm from Chef Edgar Kano’s creations like the roasted sablefish with dungeness crab and dill emulsion, black currant and gastrique jus. Pair each course with personal recommendations from an onsite Veuve Clicquot ambassador with the perfect wine for your palette. Specifically for Valentine’s Day, YEW is partnering up with Garlands Florist to provide each reservation a romantic surprise with a selection of florals to have awaiting them at the table. For a memorable Valentine’s dinner, Vancouver and our wonderful restaurants are at your service. Be sure to make a reservation today since the most popular spots are filling up quickly. If you can’t get in to one of the above spots, check out our list of Best Sushi Restaurants in Vancouver. With more than 600 sushi restaurants ranging from cozy joints to sophisticated locales, you’re sure to find a location that’s perfect for your romance.